Sun City Grand is the third Del Webb active adult community in Phoenix's northwest valley. It hosts a bountiful lineup of amenities, social activities, and golf courses. Residents of Sun City Grand cherish their smaller community for its newer homes in a quiet, uncongested location in Central Arizona. After the completion of the popular Sun City West community in 1996, Del Webb Corporation began construction of Sun City Grand. Like the previous Sun City and Sun City West, Sun City Grand was designed around the notion that active adults should be able to live in an entirely self-contained community with access to nearly every imaginable amenity. Many retirees are lured to these resale homes that offer modern floor plans and finishes favored by today's active adults. Some of the homeowners in this community are previous residents of the other Sun City developments who moved to escape the older, more congested areas of Sun City and Sun City West. Designed to meet the evolving needs of active retirees, Sun City Grand offers an exciting array of amenities that feature some of the latest concepts in active adult living such as a continuing education center and a luxurious spa. The Village Center is the recreational focal point of all activity in the community where you will find most of the amenity buildings. It has a beautifully landscaped courtyard and cascading waterfalls that provide a serene setting to mingle with neighbors and attend community events. The Sonoran Plaza features a 9,000 square-foot grand ballroom, meeting room and multi-purpose hobby and craft studios. The Adobe Spa and Fitness Center offers a state-of-the-art fitness center that includes an indoor lap pool, outdoor resort-style pool, indoor walking track and dance and exercise studios. Residents enjoy relaxing and getting pampered at the full-service Cimarron Day Spa. The spa provides custom packages, massages, facials and body treatments. The Cimmaron Center even has a fitness center and meeting rooms. 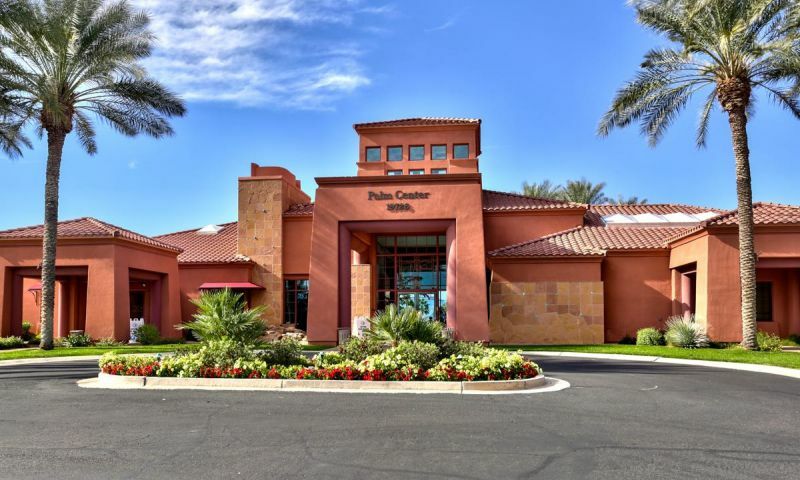 The Palm Center is home to a Visitor's Center as well as the studio for Sun City Grand's very own television station! There are many outdoor attractions in this 45+ community that are enjoyable nearly every month of the year. Several outdoor resort-style pools are filled with residents looking to stay cool on the hot Arizona days. Additionally, there are tennis, pickleball and bocce ball courts. This active adult community offers four championship golf courses (Cimarron, Desert Springs, Granite Falls North, and Granite Falls South) that were designed by PGA Hall-of-Famer Billy Casper and renowned golf course architect Greg Nash. The deep greens and shimmering lakes make the courses fun and challenging to players of all skill levels. Del Webb offered over 50 floor plans in Sun City Grand. The community sold out of new construction homes in 2005 but a continually changing lineup of pre-owned resale homes are available. Homebuyers can choose from a variety of condos, villas and single-family homes that range in size from 805 to nearly 3,000 square feet. Some buyers favor the homes in this development over the previous Sun City communities due to their more modern floor plan designs and desirable finishes. The upgraded homes come at a premium and are generally more expensive than comparably sized homes in Sun City or Sun City West. The community's ASU Lifelong Learning Academy provides the residents with a fully integrated continuing education center. Residents gain exposure to a wealth of knowledge on various topics that range from business and science to culinary classes and wine tasting. The Academy provides residents the opportunity to listen to accredited speakers and partake in group discussions and hands-on classes. There are dozens of clubs, activities, and classes that regularly meet. Whether your interests are arts and crafts, card games, sports and fitness, or social functions, there is sure to be something that fits your unique interests. Situated in Surprise, Arizona, this active adult community is conveniently located near many shopping outlets and cultural attractions. Within 12 miles, residents can enjoy the Arrowhead Mall, Challenger Space Center, West Valley Art Museum, Wildlife World Zoo, Arizona State University-West, Rio Salado College and Lake Pleasant. Plus, sports enthusiasts will enjoy the proximity to sporting venues hosting local teams such as the Cardinals (NFL), Coyotes (NHL) and several Major League Baseball spring training camps. The Sonora Plaza is located at 19753 N. Remington Drive. Ballroom - 9,100 Sq. Ft. The Chaparral Center focuses on educational services and is located at 19781 N. Remington Drive. The 34,574 square-foot Cimmaron Center is located at 17100 W. Clearview Blvd. The Adobe Spa and Fitness Center is located at 19775 N. Remington Drive. Clubhouse - 33,129 Sq. Ft. The Palm Center houses the community association management offices, as well as the Visitor's Center and the community's own TV Station. There are plenty of activities available in Sun City Grand. Here is a sample of some of the clubs, activities and classes offered here. La Solana is made up of seven condo buildings containing 252 total units. These units offer 427 to 1,021 square feet of living space. There are six floor plans that feature one to two bedrooms and one to two bathrooms. Garden villas were offered in three floor plans that range from 1,097 to 1,484 square feet in size. These homes feature one to two bedrooms, den options, one-and-a-half to two bathrooms, and an attached two-car garage. The Cottage Series offered three floor plans that range from 1,161 to 1,392 square feet in size. These homes feature two bedrooms, two bathrooms, and an attached two-car garage. The Courtyard Series offered four plans that feature one to two bedrooms, one-and-a-half to two bathrooms, and an attached two-car garage. These homes range in size from 1,096 to 1,441 square feet. Floor plans in the Classic Series were designed with two to three bedrooms, two bathrooms, and an attached two-car garage. There were 11 floor plans that feature 1,120 to 1,814 square feet of living space. The Premier Series offered 17 floor plans that feature 1,416 to 2,410 square feet of living space. These homes feature two to three bedrooms, two or two-and-a-half bathrooms, and an attached garage. The Estate Series offers the largest homes in Sun City Grand. There were 11 floor plans that range in size from 2,290 to 3,388 square feet. These homes feature two or three bedrooms, a den, two-and-a-half to three bathrooms, and an attached garage. This is one of the best retirement communities around. They have so much to do with swimming and exercise facilities and hundreds of classes and groups to get involved with. The location is great too off Bell Rd with shopping, dining, and now easy access on to loop 303. My wife and I moved here from Akron, Ohio in 2013. We absolutely love the place! By chance, we had visited the area on Sun City Grand's opening weekend years ago but, at the time, were not yet age-eligible and ready to acquire a property here. We followed the community's development over the years as we had decided that Arizona would be a frequent vacation destination until our retirement. When that day came, we found a wide range of extremely well maintained homes available for purchase in the secondary market and, as luck would have it, located exactly the house we would have built 'way back then' had we been able to do so. Since settling here, we have made good friends and taken advantage of the many amenities appealing to our respective interests. We find ourselves in possibly the best physical conditions of our lives thanks in large measure to the many recreational opportunities the Sun City Grand community and our surrounding area offer. We have found the many shopping, entertainment and recreational opportunities immediately outside Sun City Grand itself to be convenient and readily accessible. In addition, the 'high country' of Arizona is easily reached within a fairly short drive as is downtown Phoenix, our nation's sixth-largest city, with all the aspects of 'big city living' you might want. In like fashion, Scottsdale - a very upscale community with all that this implies - is only about twenty miles east of us. With the exception of its challenging winters, we were happy with our lives in Akron but we are absolutely thrilled to have 'made the jump' here. I really enjoy the friendly atmosphere of Sun City Grand. I've made more friends than I have time for! I typically walk every evening and I really enjoy chatting with my neighbors and feeling like I am part of a big family. My home is the Desert Rose floor plan and I get so many compliments on how beautiful it is. The layout is great for my home office plus there is an extra bedroom for my daughter when she visits from Nevada. 55places.com is not affiliated with the developer(s) or homeowners association of Sun City Grand. The information you submit is distributed to a 55places.com Partner Agent, who is a licensed real estate agent. The information regarding Sun City Grand has not been verified or approved by the developer or homeowners association. Please verify all information prior to purchasing. 55places.com is not responsible for any errors regarding the information displayed on this website.